Pancakes are definitely a fave breakfast here! After enjoying them for breakfast, there are always extras. Storing these delicious extra pancakes in the freezer to locate on another busy AM is a great plus! 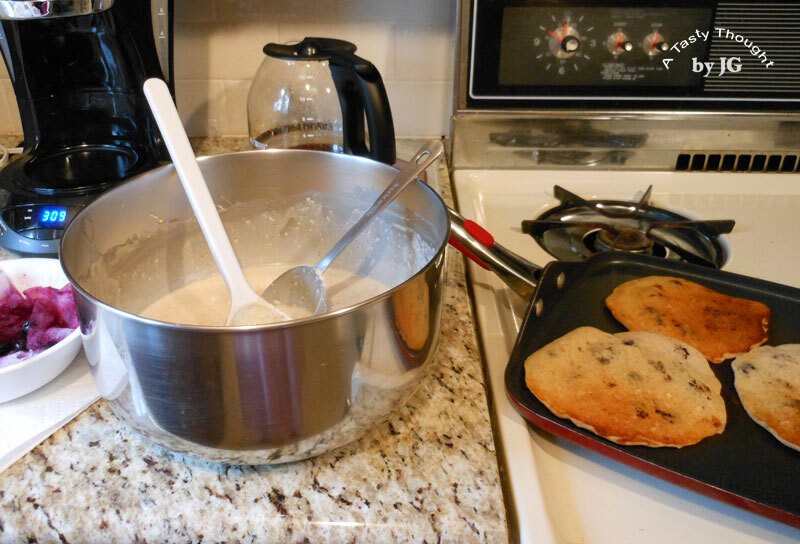 Who has time to make pancakes every time a family member dreams of them for breakfast??? ***After the extra pancakes cool, place each in a sandwich bag. Then, place bagged pancake stacks into a Ziploc Freezer Bag. Into the freezer they go for other mornings! Just as my DH & I have our individual fave baseball teams (that Red Sox vs. Yankees dilemma) we are partial to specific pancakes. Me - I really like Awesome Oatmeal Pancakes - light, full of fiber, buttermilk, nutmeg & cinnamon. I like anything containing Oats. 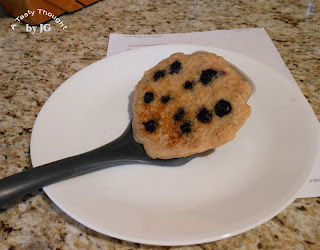 My DH would much rather dine on Blueberry Buttermilk Pancakes - light, containing blueberries, buttermilk, nutmeg & cinnamon. Yes, just like the photo in my header, only just not a plateful at once. Earlier this week there was a little compromise going on...Blueberry Oatmeal Pancakes. It was another take on this 2-step Oatmeal Pancake! This AM two frozen pancakes/person were placed on plates and popped into the microwave. An easy quick nutritious breakfast on a chilly busy AM. ***The Oats soften in the Buttermilk overnight. Makes a light pancake! Yummy! Combine Oats, Cinnamon & Nutmeg. Add Buttermilk, stir well. Next morning - add additional Buttermilk, stir. In a separate bowl stir Flour, Sugar, Baking Soda & Baking Powder. Add Egg + Egg Whites & Olive Oil. Stir all, adding small amount of Buttermilk if needed. Pour 1/4 cup portions on heated non-stick griddle. Add 10- 12 Blueberries to portion on griddle. These pancakes are absolutely delicious! Full of fiber! And filled with Blueberries! A definite treat in the spring...fresh Asparagus! Every year during the short season that it is available (and for a reasonable price /pound) we enjoy this veggie at dinner. Quite often I've viewed photos of roasted asparagus. For me, the tried and true method of preparing this yummy veggie is placing the cut cleaned stalks in about 1 and 1/2" of boiling water in my 1 and 3/4 quart Blue Cornflower Corning Ware container on my stove. Using a square container works so well. After the stalks are tender and removed from the boiling water, place on a serving dish. A small amount of butter/margarine is placed on the top to melt. Yum! It tastes great with any main dish! I am not convinced that my sons have developed a taste for this delicious spring treat, yet. It never comes up in conversation. When they are "back home" I haven't surprised them with a test of their current culinary tastes with this particular veggie. However, I do know that fresh Spinach in a salad has now made their yummy healthy list! Asparagus is definitely a wonderful vegetable to enjoy when in season! Cut about 1 and 1/2" off end of stalks (discolored part) and toss. Double rinse in cold water. Separate into two groups - tips and without tips. Add only ends without tips to boiling water in container. Cook 6 minutes at a medium boil. Add tip ends to boiling water. Continue cooking Asparagus for 5 minutes at medium boil. 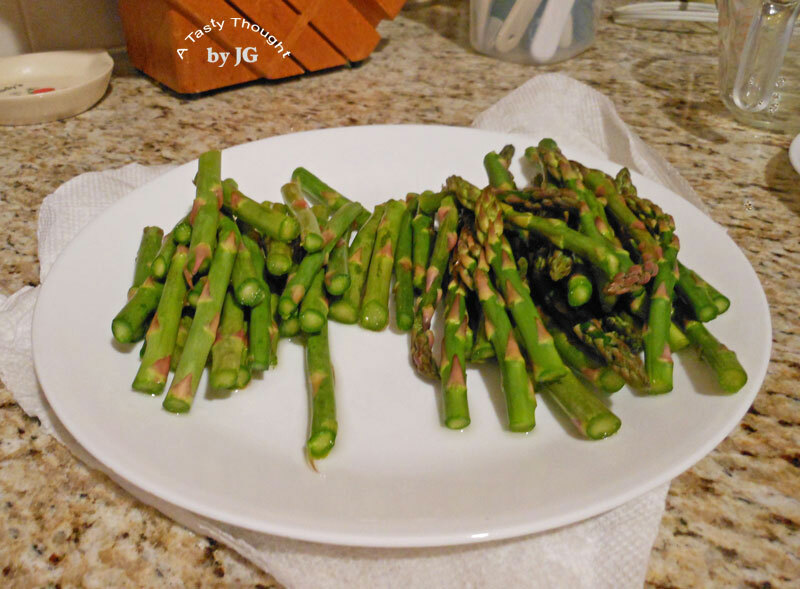 Using a large fork remove Asparagus from water and place on serving dish. Place small amount of butter/margarine on top of hot veggie. *If the purchased bunch of Asparagus will not be prepared the same day, I wrap the bottom cut ends in a wet/squeezed out paper towel that been folded into thirds. Return the stalks to the plastic bag and refrigerate. It keeps the vegetable fresh until preparing the next day. I also only purchase stalks that have been sitting in a small amount of water in a tray. Ready to be flipped over! The sun was shining brightly Monday AM. It was time for breakfast and we were starved! Opening the fridge and then the freezer door quickly revealed that any of the "stashed" breakfast goodies were...well...GONE! What were we thinking? Easter weekend was filled with many good chats, much FuN laughter and many hearty appetites. Looking over to the Banana Bowl on the counter there were two overripe spotted bananas! 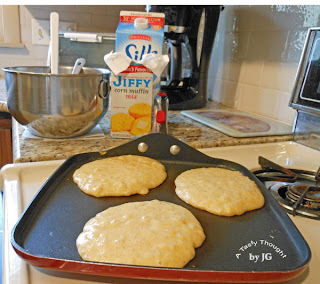 I knew that one box of "Jiffy" corn muffin mix was waiting to be opened. This mix for corn muffins makes the best muffins - I've eaten these muffins since my childhood. NO, not since 1930! :) And the pancakes = Yum! 2 Eggs Whites replaces the 1 Whole Egg. Soy Milk replaces Whole or Low Fat Milk. Olive Oil for sauteing and baking replaces the melted shortening. And 2 sliced Bananas are mashed before adding into the batter. Banana Cornmeal Pancakes are scrumptious! While the toaster oven is at work...the egg is frying. After turning over the egg it's usually clockwork. The toaster oven rings and the Cinnamon Raisin English Muffin is ready. A slice of American Cheese is placed on one half and topped with the Fried Egg. The next one is started! This week my grocery store (Big Y) has a special on the Thomas' Cinnamon Raisin English Muffins and there is room in my freezer. 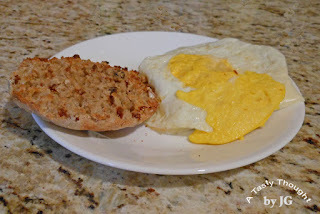 I like to split the muffins before freezing them and they are always a great find in my freezer for a quick and easy weekend breakfast! 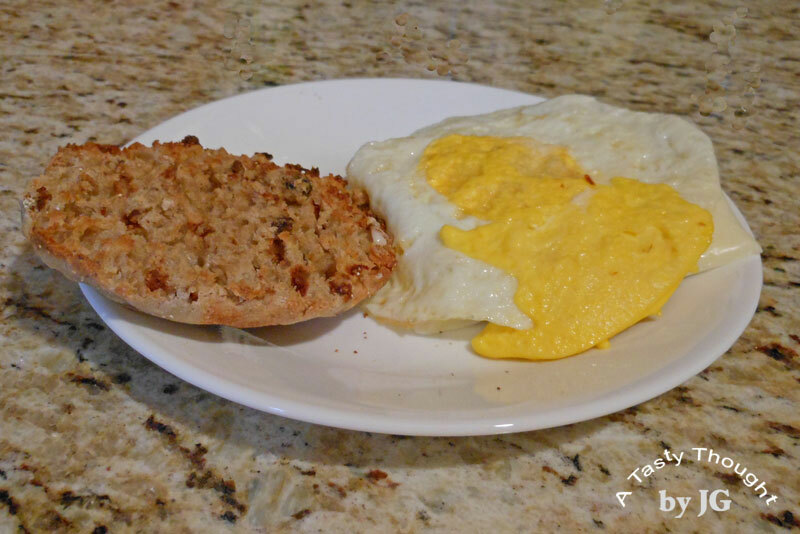 This is one tasty Egg Sandwich!